This was an absolutely delightful book about (as the title says) four sisters and the young boy they meet on their summer vacation. The story (and the series itself) sort of reads as a more modern version of the Ballet Shoes by Noel Streatfield (if anyone remembers reading those as a child). The sisters, Rosalind, Skye, Jane, and Batty, are a fun mix of personalities: Rosalind, the oldest at 12, tries desperately to take care of her younger sisters, as she promised at her mother's deathbed. Skye is the tomboy of the family, Jane the dreamer, and Batty an independent minded four-year-old. There's nothing profound about the story, but the misadventures of the family are wonderfully and simply told. This sequel to The Penderwicks holds the same charming cast of characters as the original, and it was a joy to go back to their world. In this story, the four Penderwick sisters join forces to thwart their father's efforts to re-enter the dating world (in response to a request made via letter by his wife before her death--not out of any personal inclination). Although the ending is pretty obvious from the beginning of the story, it's still fun to see the sisters in action. I love how well Birdsall describes the world of children--particularly of Rosalind, who is just emerging from childhood into adolescence. A good read for anyone who likes well-written children's lit--particularly for girls (probably 8-12). The third book in the series is another charming installment of life in the Penderwick family. 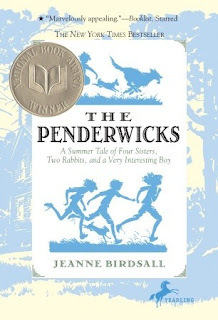 The three youngest Penderwicks go on a summer holiday with their aunt to Point Mouette, Maine, while Rosalind is off to visit a friend. Although everyone agrees Rosalind deserves the vacation, this leaves Skye as the OAP (Oldest Available Penderwick) and she's distinctly apprehensive about the responsibility. The only bright spot, for Skye, is the possibility of a visit from their good friend Jeffrey (from the first book). Jane and Batty, meanwhile, befriend a neighboring musician and discover--to their surprise--that Batty might actually have musical talent. As the various friendships grow over the summer, the sisters make an alarming discovery about their new neighbor--one that might tear apart the relationships they've worked so hard to build. This third book has a little more drama than the first two books, but I still enjoyed the warmth of Birdsall's writing. I did miss Rosalind (probably my favorite sister) and wish she'd been around for more than the first and last chapters. However, this book was still a fun and heartwarming read. I'm curious to see where the Penderwicks go next! Mature Themes: mild discussions of death, as the mother died of cancer when the youngest (Batty) was born. I adore the Penderwicks. They're like a younger, modern-day Little Women. I love the Penderwicks!! They remind me of Edward Eager's "Half-Magic" or Elizabteh Enright's "Gone-Away Lake". They make for comfy, happy reads, and they are told so well! She makes it easy to identify with the characters, who feel very real. I especially identify with Rosalind, who's always trying to take care of the younger three, and Jane, who wants to write and loves to dream. I also love the way Ms. Birdsall names the books Jane reads. I always get this shiver of excitement when I see that Jane loves a book I do! Truly a wonderful series!